Get a whiff of this! A U.S. based national furniture retail chain wanted to move more product, and the company decided to try something fairly unconventional— rather than pumping more money into TV Commercials, instead they pumped fragrance into its stores. While the line between correlation and definitive causation can be difficult to draw, the chain was bullish about the uptick in sale. So much so that after running a test pilot scenting program, it rolled out scent marketing systems in over 100 stores last year. Scientific research has shown that there is something to an assumption that has been widely held within the furniture industry for years: namely, that the smell of fresh-baked cookies or other pleasant aromas can have a positive effect on the customer experience and, by extension, sales (the average customer ticket size increased by 20 percent). In a famous study by the marketing researcher E.R. Spangenburg and colleagues, pumping a pleasant scent into a simulated retail environment had a distinctive effect, with the research subjects being more likely to say good things about the environment and products in a scented room versus an unscented one. Scent choice should be matched to the store’s brand and other strategic objectives. Most businesses have no idea how to go about choosing the right scents, so when we consult with clients we think it’s important to ensure they understand the “primary colors” of ambient scenting—otherwise known as the six scent families—and their likeliest emotional and cognitive effects. For example, the citrus family—lemon, lime, mandarin, orange, grapefruit, bergamot and clementine—is often described as crisp and clean. Research shows that the aroma of grapefruit tends to have an uplifting, energizing and refreshing effect, while lime can be cheerful, uplifting and purifying. Think about the adjectives used to capture the essence of your brand (or of specific product lines or categories). At bare minimum, citrus family scents that convey “clean” and “fresh” can be a good idea for clearance areas, as shoppers sometimes have unconscious concerns about the quality of items in these areas. Meanwhile, floral scents such as rose, jasmine, gardenia, orange blossoms and violet are often most appropriate for upscale furniture stores or room settings. If the product setting is one in which shoppers might expect to find a bouquet of fresh flowers, a floral scent might well be a good fit. However, if the room is full of patio or other outdoors-oriented furniture, the outdoorsy scent family could be most appropriate. These fragrances include woodsy notes such as pine and cedar, green notes such as fresh green grass and mint, and herbal notes of basil and sage. Scenting strategies can also hinge on other considerations such as eliminating bad smells and odors, for this reason furniture stores are wise to try to eliminate malodors from paint, vinyl, foam and other fresh-out-of-the-factory materials. These smells can be distracting and unpleasant for consumers. In some cases, specific fragrance formulations can be used to neutralize problem malodors while simultaneously providing a pleasant scent effect. Scientists have recorded all kinds of other ways in which the presence of a pleasant ambient scent can cause people to engage in largely unconscious behavior, including being more honest at the cash register. Researchers now believe humans can distinguish more than 10,000 different aromas. That means leaving the scent impressions in your store to random chance is a risky strategy. 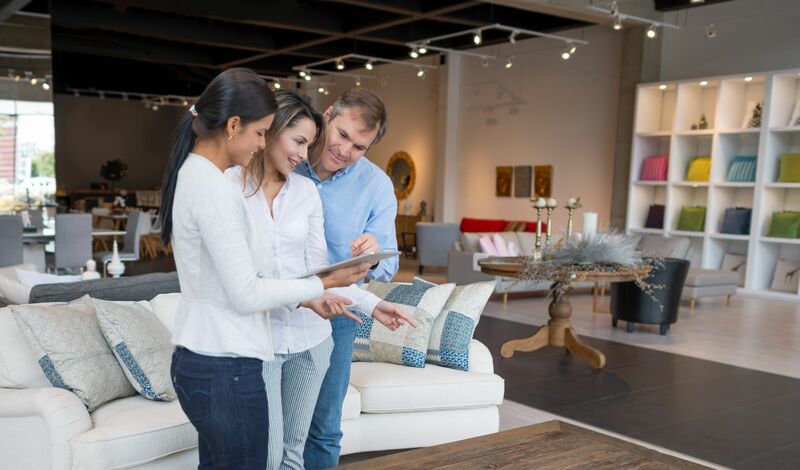 Furniture retailers invest lots of money in lighting, décor, sound systems, flooring, product displays and more in a bid to create pleasing, multisensory selling environments. Why neglect the nose, which is, after all, one of shoppers’ primary tools for exploring their world? Success tastes sweet, but it smells even better. Want to learn more about scent marketing for your furniture store or business? Contact Scentsational Impressions and speak with a “scentologist” about how we can provide the sweet smell of success at your business, and we’ll even provide you with our 30 day risk-free trial offer.